One benefit of writing this blog is that it gives me an excuse to sit down and talk with our rabbis at much greater length than I normally would. This is the second in an occasional series of interviews with the rabbis of Temple Sinai, my Reform congregation in Oakland, Calif. 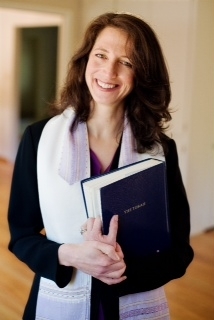 Rabbi Andrea Berlin came to Temple Sinai in 1998 and recently moved to a regional position with the Union of Reform Judaism. She exudes an infectious delight in Jewish learning, and inspired near-groupie enthusiasm among both adults and teens taking a class in medieval Jewish thought with her. Rabbi Berlin, 40, has two children with her husband Jon. 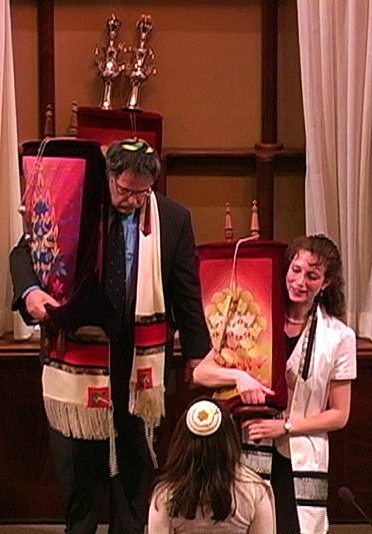 She was the rabbi for my daughter’s Bat Mitzvah, but I had never asked about her own beliefs until we did this interview. Q: Tell me about your Jewish upbringing. Were you raised Reform? A: I was raised as a socialist Reformadox. Q: That’s a great label! But what does it mean? A: We’d have to start with my dad, who during World War 2 spent half his time in the United States and half his time in England. His birth father was an Orthodox factory owner who made women’s coats in England. The man who raised him here was an atheist socialist and one of the major movers behind the Ladies Garment Workers Union. My dad came into the marriage with my mom being non-practicing, but having both socialism and Orthodoxy as very strong passions, with socialism the most predominant. My mom grew up in New York Orthodox family…not Orthodox herself but very involved in Judaism. Passover showed all the variety of my family. Q: So tell me about Passover in your family. A: We worked out of the regular Maxwell House Orthodox haggadah, with supplements from the union haggadah – not the Union of Reform Judaism, but union as in AFL-CIO It had a lot of pro-labor, pro-union, freedom-for-the-working-class type poems and songs. Then as we got more and more involved in the Reform movement, we would bring home the Reform liturgy. It was all over the place. I grew up having bacon and eggs, but God forbid you ever put milk on the table with the bacon because that was just not kosher. As I’ve become more religious, I’ve dragged my parents along in the process. I went to Reform religious school in third grade. It took a while to get there. We started Orthodox, and then went humanist. When I came home and explained that God was the opiate of the masses, my parents decided to try Reform. Q: What made you decide to become a rabbi? A: I don’t know. I was very, very young. When I was nine, I was tall for my age so when we would play house, I would always have to be the mom. I would have to do the dishes, which I didn’t like. So the bargain I struck with my non-Jewish neighbors was that if we could play temple first and I could be the rabbi, then we could play house and I would be the mom. That’s one of my earliest memories. Q: Let’s jump straight to the serious stuff, like I did with Rabbi Mates-Muchin. What’s your conception of God? A: It changes every day. I have both an immanent [personal] and a transcendent conception of God. The immanent one is probably the more difficult to articulate. It’s instinctual, a gut relationship. I very much feel God’s presence. I feel I can communicate with God and, if I am quiet and open and humble enough, I can get a sense of God and of direction. Then there’s a transcendent belief where God is the force behind Creation. It was a conscious, decisive force with the intent of creating the world. I believe that God is ever present, but God’s relationship to the world has vastly changed over the history of humanity. Q: Focusing on the transcendent — God as a force behind Creation. Is there something you would call a mind? A: I think there’s a consciousness. It’s something so vastly different from anything we can comprehend that to call it a mind would be giving it attributes that are probably inappropriate. We can probably perceive .009 percent of what makes this thing. Q: Did this consciousness communicate with our forefathers and the prophets? Was Abraham actually talking to some one or some thing? A: The reason I’m hesitating is that I have a foot in both doors. If I were answering from my religious instinct, I’d say that Abraham certainly received communication from God. I’m not sure it would have been in words, but the medieval Jewish philosophers talk about God placing thoughts and images in the minds of the prophets. On the other hand, looking at it from my academic view, Abraham didn’t exist. But the Torah still contains divinity even if Abraham didn’t exist. It was a way of giving us very important information that we needed to have through the voice of this Biblical character. Q: When instructions like the Ten Commandments were conveyed to the Jewish people, were those actually the words of God, or of a prophet, or of a writer of the Torah? A: I think there’s a divine spark in all of it. I would make a very sharp distinction between the written and the oral Torah [rabbinic commentaries]. To me, the oral Torah is an example of human beings struggling with written words. This is where I would break from Orthodox theology – I don’t believe in the infallible tradition, that somehow the oral Torah, everything a rabbi would come up with, was handed down by God at Sinai. I do believe that our brains are holy, our seichel [wisdom] is incredibly holy, so that must come from God. But we invent it in each era. A: The written Torah ends at the end of Deuteronomy. The oral Torah is Talmud and Mishnah and the codes and everything that comes after. With written Torah, I feel it’s irrelevant where it came from – the fact is it’s holy, and we’ve treated it as holy. Whether written by God or human beings, it was designed to be studied in concert with our human instinct. Therefore it is a living, ever-evolving book. The mistake we make is to take it literally. As long as we don’t do that, it can have a holy influence in our world today. Q: Let’s take some of the stuff that you wouldn’t follow today, like stoning people. A: Not only shouldn’t we take it literally, but we’re meant to struggle with it. I also think it’s possible that God has evolved. God’s relationship with humanity has changed – not only because we’ve changed, but why couldn’t it also be that God has changed as well? Even though God exists out of time, God is learning about human beings as we’re growing. So I don’t necessarily think that God today would repeat that you take a child outside the gates and stone him if he curses his father. Q: But do you think God actually had anything to do with that rule or was it just what people did at that time? A: I teach Torah from a historical perspective, where we look at the Near Eastern codes. So when the authors wrote that, they were borrowing from what they knew of society. At the time, it was the only way you could maintain order and control. But talking about me personally? I think it’s irrelevant. Even the words that cause me pain are holy and I have to treat them as such – that doesn’t mean follow them, but argue with them and change them. The rabbinic tradition I share is called pilpul, where you change the words so much that you come out with the opposite conclusion. The unholy thing would be to ignore them. Q: And those words are holy because they’re our tradition? Or because they were inspired by God? A: Because they exist in a holy book, inside the Torah. Even the words I believe are wrong are holy. Q: Would the words in any holy book be equally holy? Are the words of the Quran or Hindu scriptures equally holy? A: To Muslims and Hindus, yes. But Torah is mine. It’s holy for me. A: Judaism teaches that I am bound to Torah because my people accepted it. I chose to accept it; it’s a covenant I have with God and the Torah. It does not apply to someone who does not want to join that covenant. It’s not the same theology as saying, “This is a holy book, everyone needs to adhere to it.” Only the people who are part of the covenant need to adhere to it. Q: But if there was a God powerful enough to create the entire world, wouldn’t that God have created one set of moral rules for the whole world? The question is why those two words [said and saying], why the redundancy? God spoke the Ten Commandments to one community so we’d all hear them together, and also said them individually in everybody’s ears because we all learn and hear differently. While that was true for the Ten Commandments for the Jewish people, I feel it was also true for the greater objective truth of the world. There can be this one God but because we’re all different, we’re going to understand God differently. And what’s nice is that the fundamental principles that thread through all these books are the same. You can’t murder. You can’t commit theft. There are things you can’t do, and they’re pretty consistent across the board. Q: Let’s talk about your immanent or personal sense of God. Is this something you’ve always had? A: As long as I can remember. It’s not consistent with any sort of intellectual attempt to articulate or understand it. Q: Does it come to you at particular moments, like through praying or being in nature? A: It’s like any relationship. I always have it, but there are times when I access it more often. It ebbs and flows. There are times I feel more distant from it, usually when I’m angry. But it’s also something I talk very little about. My job as a congregational rabbi is to help people articulate their own views of God. So I don’t bring mine into that, since it would disrupt that process. It’s very rare that I actually talk about my relationship with God. Q: Well, now you get to talk about it! It’s interesting to me because it’s completely alien from my experience. I have never experienced anything remotely Godlike on a personal level except a sense of being part of the universe when I’m in nature. A: It might be the same thing, only we have different labels for it. Q: I’d still say on my end, it’s pretty minimal. So… what is it you actually feel? A: It’s hard to define. A closeness to an entity. It’s different from a human being, but I assume the feeling of being in relationship is similar. I feel I am “in relationship” to something else. When you were talking, I remembered when I climbed Half Dome and there was this moment when I was exhausted. I had my pack on, it was hot, I couldn’t get enough oxygen – I was done. I ate a fruit bar and found my second wind. But from that time until we got to our stopping point, a couple of hours, I was walking with God. It was suddenly crystal clear to me. The mountains around me still had snow on them, and I felt like an artist was standing next to me showing me his work. It was an incredibly powerful experience. On a more mundane scale, this morning I led minyan [prayers]. When I’m davening, I don’t always pay great attention to the words, but when I do, it’s almost like reading a diary given to me by someone else. Then in the moment when we’re quiet, I really do feel like someone is listening to me. And often during the day, if something comes up, I can communicate to God and I feel like I’m being heard. Q: Does God respond in terms of giving you answers? A: Not answers. Sometimes I get a sense that I’m being cared for. Or there are coincidences that couldn’t possibly be coincidences. It feels like what Rabbi Larry Kushner calls “the invisible lines of connection.” It feels like there’s something bigger there than just a coincidence. That will often give me confidence about what my next step should be. Q: When you pray, are you praying FOR things? Are you praying that your new job goes well? That God will be there for you? Are you talking to God? A: When I teach Torah study, I always pray that I’m accurate and that the class is exciting! So basically, I pray that I’m not going to make stuff up. I pray for strength. Usually it’s not about getting something; it’s about what aspect of myself I need. I do always pray that Jon and I can raise our children to be happy and healthy mensches. We’ve gone through some very frightening health crises with them, and I’ve prayed very hard at those times. Q: But during a typical morning minyan? A: There are prayers of supplication and prayers of benediction — benediction meaning “gratitude.” So most of my prayers are prayers of gratitude where I think about the kids, about Jon, my sister or friends. Sometimes on a Friday night I’m looking around the congregation and thinking about the work I get to do and am grateful for that. I always close with a “happy healthy mensch” prayer for the kids. Q: Your sense of being cared for by God — is it fleeting or does it stay with you? A: Again, I would compare it with a human relationship. My sister lives in Boston. When I talk to her, she’s right there. But when I’m giving the kids a bath, she’s not in the front of my mind. The same thing is true with God. Q: How would you describe your Jewish practices compared to the majority of Reform rabbis? You are the most traditional of our three rabbis at Sinai. A: I am to the right of most of my colleagues on everything — politics and ritual. With maturity, I’ve become a lot more relaxed. I used to be very uptight about what I thought Jews should and shouldn’t do, but age changes things. For example, I keep less strictly kosher now than we used to. I don’t mix milk and meat when we’re at home, although I’m willing to do it when I’m out if I can’t avoid it. Q: Given your preference for tradition when it comes to ritual, why are you a Reform Jew rather than Conservative? A: The philosophy. I might choose to practice this way [traditionally], but I absolutely believe in Reform’s intent of combining Torah with seichel — our common sense and ability to interpret. I love that we don’t lose the forest for the trees, that we don’t allow the letter of the law to corrupt the intent. I love the way we do holidays. I love the way we mobilize around social action. That’s a huge reason why I’m a Reform Jew. I believe the Torah’s basic mission is to bring light to the world, and how else are you going to do that if you’re not out in the street actually doing it? I love the way we do education. I love the way we allow modernity to enhance our Jewish experience. Q: Have there been challenges as a congregational rabbi who is on the more traditional side? A: Being politically right has been more of a problem. It’s mostly around Israel. I was raised with the understanding that Jews supported Israel, period. Q: And Jews shouldn’t ever criticize Israel? A: If I’m not living there, I’m hesitant to do so. There’s plenty of criticism of Israel, but you still need to stand behind her and her survival. Q: How does that come out in congregational life? A: People take umbrage with our curriculum in preschool and religious school, or with the sermons. Rabbi Chester usually gives the pro-Israel high holiday sermon. People talk to me about it afterward, complaining, and don’t realize I’m actually to the right of where he is. Or they’re uncomfortable with the word “Israel” itself – forgetting that’s our name, who we are, having nothing to do with the country. But people react to it in our prayers and that’s hard for me to navigate. I can listen to people say whatever they want about God and there’s no personal response from me. But Israel’s a different story. Q: Well, God’s a little more powerful than Israel! A: I believe in the two-state solution. I don’t want to sound like Meir Kahane. And thinking about people in the world, the Palestinians are probably in the most precarious situation. We need to take that into account. But what I have trouble with are people who start the conversation with the premise that Israel’s existence is not a foregone conclusion. I find that here [in the Bay Area]. And I don’t know how to be a caring professional rabbi around that discussion. Q: Off of politics and back on ritual… where do you see Reform Judaism going with ritual? The movement as a whole is more traditional than it was 20 years ago. A: I believe we are heading toward post-denominational Judaism, where the lines between the movements are much more fluid. How that will look, I have no idea. Cyber-Judaism is going to have a huge influence on brick-and-mortar Judaism, and I don’t think cyber-Judaism is delineated by denominations. Rather than Reform ritual, we’ll be looking at “modern ritual” that encompasses Reconstructionist, Reform, Renewal, Conservative, Modern Orthodox — ritual that will bring the movements into a more intimate working and sharing relationship. Q: What do you mean by cyber-Judaism? A: Communities will evolve from people knowing each other in person into the cyber-world, or from meeting in the cyber-world into knowing each other in person. Even right now, I can think of several colleagues who have become very close in the cyber-world and they see each other at conferences. I can see the same thing happening with congregants. Q: Would it replace going to services? A: I’d see it as a supplement. I know we have live Web streaming, but I don’t think people will find it sustainable in terms of getting what they get from bricks and mortar. But socially, that’s how we’re going to network, and synagogues will do a lot of their business in the cyber world. Q: What is your hope and fear for the next generation? A: My fear is like this old rabbinic story. A man goes to his rabbi and says, “I can’t get to services so much – I live far away, and it’s so cold and there’s snow, so I daven at home and that’ll have to be okay.” And they’re sitting there and the rabbi moves one ember out of the fire and they sit in silence and watch the ember die. That’s my fear – that being together in ritual and prayer cannot be recreated in the cyber world. It’s like a spark of flame. You have to be present to be ignited with that flame. My hope is that we will figure out a way to use cyber-Judaism to underscore and enhance the values of Judaism. To use it as a mobilizing force around political issues, or the needy or literacy. If we can use it to keep people in touch when not physically together, that would be fantastic. Q: Anything you’d like to talk about that I haven’t covered? A: The one thing I’d like to follow up on are the times that I get really, really angry at God. Mostly it’s when we bury kids. I don’t think I’ve ever forgiven God for the times we’ve had to do that. But what’s important for people to know is that I’ve never found any reason in Judaism to feel threatened by expressing that emotion to God. Q: Meaning you’ve never felt like a bad person for being angry at God? A: Yeah, or that God’s going to take vengeance. My tradition gives me the right to be very angry at God. Q: Have you ever gotten an answer? A: No. And that’s probably why I can’t forgive God. If God expects me as a woman to bring children in this world, and as a rabbi to help people go through that kind of loss, I deserve an explanation. And it’s one I’m never, ever going to get. So it makes me mad. A: I wish I could. Then I wouldn’t be so angry. A: Of course! But it’s irrelevant if that’s what it is. You could also say that falling in love is a neurochemical reaction, but I‘m not going to divorce Jon. This is the second in a series of interviews with rabbis connected to Temple Sinai. You can read the first interview with Rabbi Jacqueline Mates-Muchin here. This entry was posted on April 21, 2011 at 8:51 pm and is filed under Belief (or not) in God, Judaism, Rabbi Interviews. You can follow any responses to this entry through the RSS 2.0 feed. You can leave a response, or trackback from your own site. I really appreciated Rabbi Berlin’s courageous vulnerability in these responses. I was particularly impressed with her willingness to discuss her thoughts and feelings about the country of Israel. This is the kind of courage and honesty I desire in my spiritual leaders. You are lucky to have such a leader at Temple Sinai! I’ve read all three! Love all the thoughtful answers to your questions. Thanks! Now that I;’ve exhausted (figuratively, maybe literally too!) all three of Temple Sinai’s rabbis, I hope to move on to interview other Bay Area rabbis. If you know any who would make for interesting conversations, please let me know.